How has RealHeal Massage Oil helped others? What does Real-Heal Massage Oil contain? Healing is about more than cure. While it is important for tissue to heal, for bones to knit and for regeneration to take place, healing also occurs on a deep emotional level. In order to heal, we also need to be nurtured, to feel safe and loved and to be cared for. We need to put aside our worries and stresses and focus inward in order to harness the natural ability of the body to heal itself. The best healers are those who are able to nurture one's own spirit and release the healing process. Natural remedies have a big role to play in healing after injury of any kind. Herbal medicines have been used for centuries to help repair broken bones, torn and sprained muscles, internal and external bruising and injuries of all types. Ongoing pain and stiffness due to conditions like arthritis, rheumatism and sports injuries respond well to natural intervention without the side effects commonly associated with the prescription drugs. Aromatherapy is a holistic form of treatment which uses concentrated extractions from a wide range of plants in order to effect and assist with healing. Therapeutic massage using carefully selected aromatherapy oils brings the important soothing element of touch to the healing process. Not only does this help us to feel good, but it also helps to release endorphins and other pain relieving chemicals in our body, thereby bringing relief. Massage also promotes the flow of oxygen rich blood to the affected areas, thereby speeding up the healing process. In addition, the therapeutic aromas enter the system via the sense of smell and stimulate areas of the brain, assisting with relaxation and pain relief and facilitating the healing process. Along with massage, one can therefore burn the oils in a special oil burner for further benefit. The area of the brain which interprets smell is very close to the area that processes emotions. Aromatherapeutic oils therefore work very effectively on the emotional level - a crucial factor in any healing process. "This massage oil works well for me with my aches and pains. As you said, I dont have to use my painkillers as much and the oil is very soothing and relaxing!" "I had bruising all over after an accident and the Realheal Oil was marvelous for the pain and the bruises disappeared in record time. A few months later I developed a painful neck and remembered the oil I still had in my bathroom. My wife massaged my neck before bed and the next morning the pain was gone. I will always keep some of this product on hand!" "Fortunately my sister bought me a bottle of your RealHeal Massage Oil for my frozen shoulder. It has been a great relief and with gentle massage every night I can begin to move it again. Best of all is I get some sleep after the massage instead of tossing and turning all night trying to avoid lying on my shoulder! Thanks a lot!" Peppermint Essential Oil - has many therapeutic uses and may be used for a wide variety of conditions including respiratory and digestive conditions as well as musculo-skeletal pain. Used in massage, peppermint has strong anti-inflammatory and analgesic properties and also assists in promoting blood flow to the affected areas. On the emotional level, the aroma of peppermint oil will relax and refresh the mind as well as the body, helping to uplift the spirits and restore courage and mental focus. Ginger Essential Oil - obtained from the root of the ginger plant, ginger, like peppermint, is a highly versatile medicinal plant with thousands of years of therapeutic history. The oil is warming and toning and has particular application to all musculo-skeletal conditions, soothing pains and aches and also helping to reduce fever. Inhalation of ginger also helps to boost tired spirits and strengthen resolve. Pine Essential Oil - In traditional herbal medicine, the shoots of young pine trees were used during bathing to treat rheumatism, promote circulation and relieve nervous fatigue. Therapeutically, pine essential oil is very effective in relieving the pain caused by conditions such as arthritis, rheumatism and gout and promotes circulation. Strongly recommended in the treatment of post surgical or post illness fatigue, pine oil is refreshing and helps to lift the spirits. RealHeal Massage Oil contains no synthetic ingredients and is manufactured according to strict aromatherapeutic principles for therapeutic use. With aromatherapy, a little goes a long way! 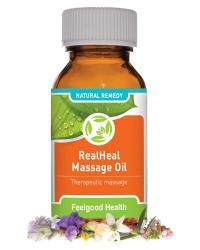 RealHeal Massage Oil may be self applied or (even better) massaged on by someone else. Pour a little into the palm of the hand and rub together to warm the oil. For postoperative and postnatal use, or for use on bruises, massage should be gentle and applied slowly with the palm of the flat hand. For arthritis, rheumatic conditions or muscular aches and pains, some pressure may be applied in order to reach deep into the muscle fibre. At no point should pressure be strong enough to inflict any pain and it is important that this be a relaxing and positive experience. RealHeal Massage Oil should not be used on open wounds or cuts. The oil works by bringing relief to the painful area by means of massage and absorption into the affected tissue as well as by inhalation of the aromatherapeutic properties of the blend. Caution: May be used from the age of 3 years. However, safety during pregnancy and breastfeeding has not been established. Contains groundnut oils and is therefore not recommended for people with nut allergies. Immediate relief is usually obtained during massage. With frequent use, healing should be greatly facilitated. For those treating arthritis and rheumatic conditions, regular use should help to minimize reliance on pain and anti-inflammatory medication as well as reduce the frequency, duration and severity of pain. Bath crystals to soothe aching muscles plus healing massage oil!